Earth friendly packaging for food grade, commercial, and industrial applications. Plascon is proud to manufacture earth-friendly biodegradable packaging that offers the same strength and tensile properties as non-degradable plastics, but is better for our environment. As global awareness continues to grow, companies are seeking eco-friendly solutions to meet packaging requirements without sacrificing quality. As the direct manufacturer, we not only carry many standard size box liners, and bags, but also have the ability to offer custom sizing for your specific application. Our FDA/ USDA approved, and BRC certified films are not only the perfect solution for food grade applications, but are also ideally suited for commercial and industrial packaging. Plascon manufactures both clear and colored films, in any grade. Colored films are a great way of quickly identifying different products at a glance. So whatever your product line is, if you require a liner or bag to protect items during shipping or storage, consider the biodegradable alternative. 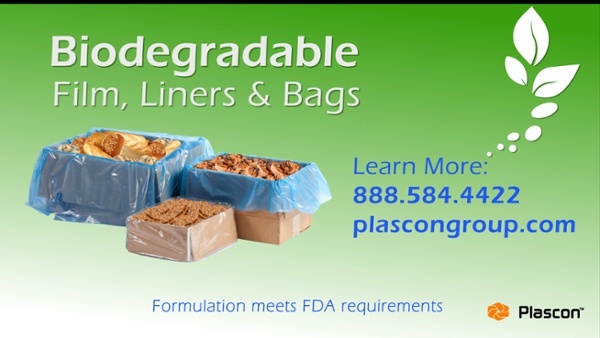 From food products to apparel, to industrial and commercial needs such as sugars, spices, and other fine powders, Plascon offers a range of biodegradable flexible packaging solutions, including custom orders to match your exact specifications. Contact us to learn more about our biodegradable packaging options!